We promise to listen to you. We promise to apply the latest proven medical practices to your care. We promise to assist in attaining your desired quality of life. We promise to apply a holistic approach to treating you, taking care of your physical as well as emotional well-being. We promise to provide excellent customer service. Dr. Liu founded this clinic on the principles that the physician is a partner in the patient’s journey to physical and mental health. Our founding promises to our patients guide us in everything we do. There is now a formal name in the industry to the way we have always practiced – the Patient-Centered Medical Home. 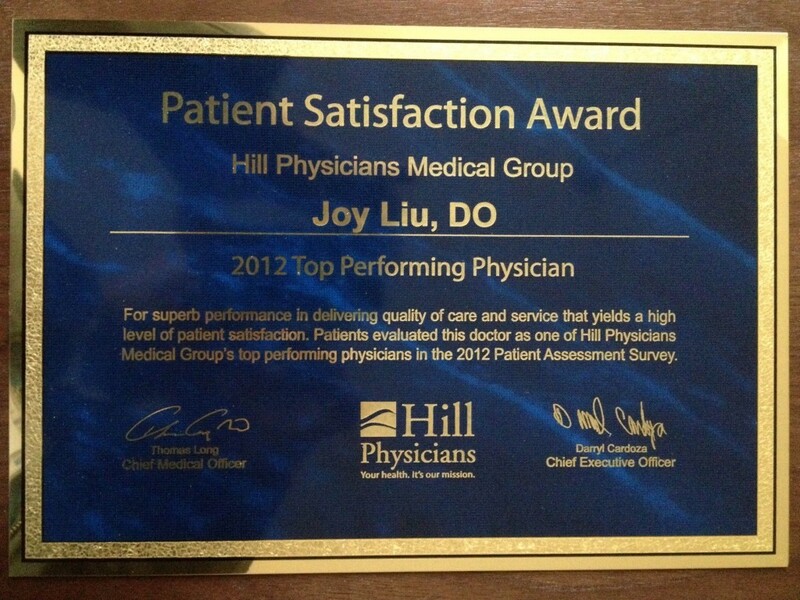 The Patient-Centered Medical Home is all about you. It is a personal model of health care. This office will lead a team of health care professionals, who together take responsibility for your care. This team includes physician assistants, health educators, pharmacists, nutritionists, and specialists. This office will be responsible for coordinating care inside and outside of this office. Comprehensive Care means your medical home helps you address any health issue at any stage of your life, from any member of your health care team. We take a holistic approach to treating you. We will dispense a dose of counseling or physical therapy or relaxation exercises or vacations as readily as we will dispense a prescription for the latest medication. Coordination of Care occurs when any combination of services that you and your provider decide are needed are connected and ordered in a rational way, and with the approach follow-up and follow-through. We will coordinate your care within this office, the hospital, or with your specialists. Continuous Care occurs over time when you can expect free flowing communication that is accurate, effective, and timely about the services you want or need, from any member of your health care team. Accessible Care allows you to initiate the interaction you need for any health issue with your care team through your desired method (office visit, phone call, email). You can expect elimination of barriers to the access method of your choice. Proactive Care ensures you and your health care team will build a care plan to address your health goals and maximizes your quality of life. We believe a patient’s quality of life is just an important as longevity and that is the patient’s choice and responsibility to decide the importance of each. Active Participation means you actively work with your health care team to develop and comply to the care plan. Be Organized when you visit. Write down and prioritize your questions and concerns for discussion with the health care team. Always keep us updated on the medication you are taking, including over-the-counter ones, so that we can help prevent interactions. Call Us before you go to an emergency room or hospital or at least let us know as soon as possible. Authorize any health care provider outside your health care team to share information with this office so that we have a full picture of your health. Welcome to your Patient-Centered Medical Home!